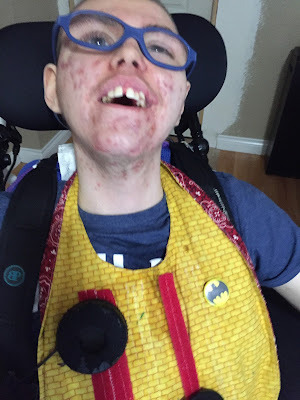 On Monday, Max made it through his entire school session. This was the first time since around October that he was able to sit through all of school. 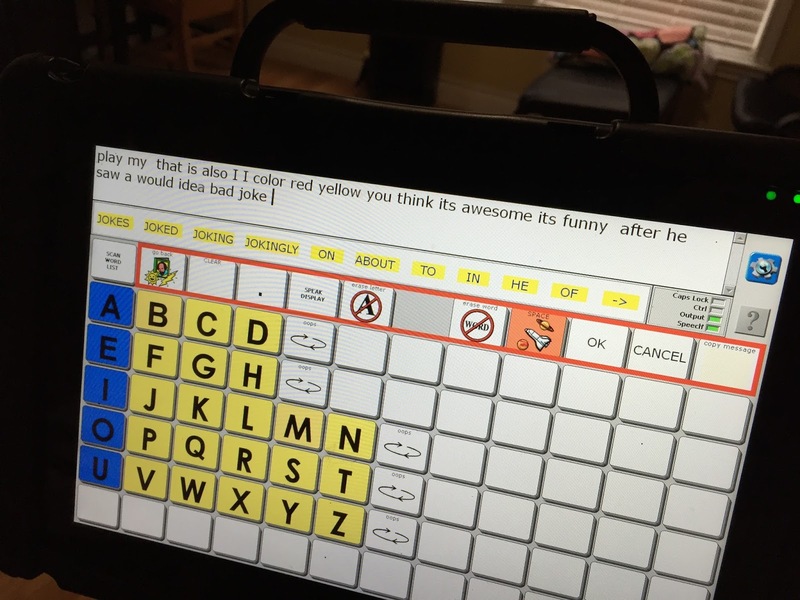 He had an idea of what he wanted to do and got to work on it! 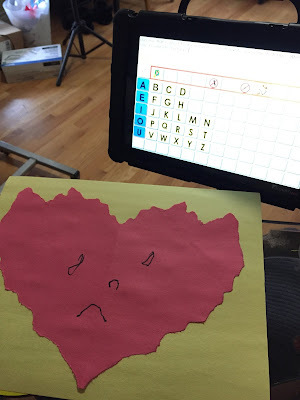 He wanted to make Valentines! He had in mind what colors he wanted, who he wanted to make them for, and what he wanted them to say. 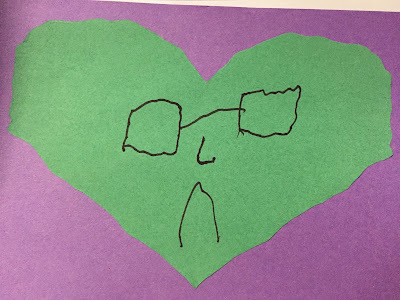 His first heart was for Daddy. 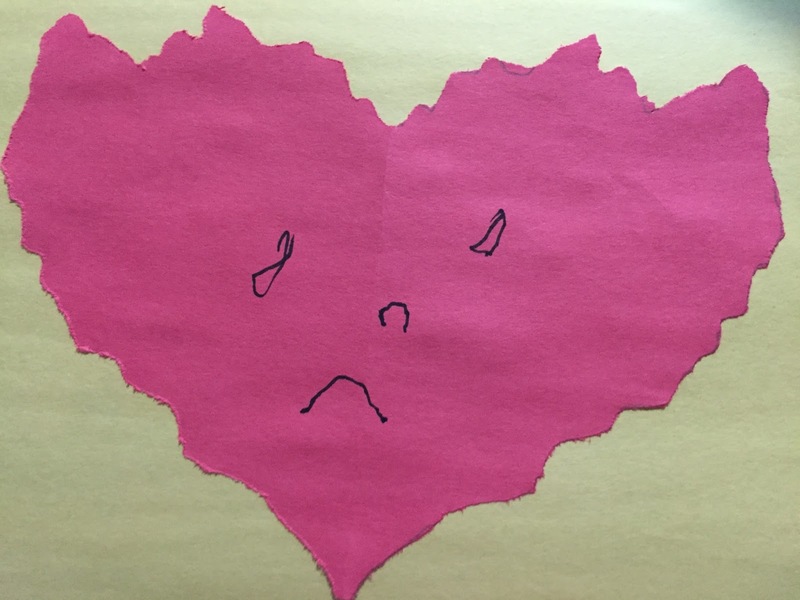 He wanted to draw the heart, and then cut it out with his special cutter. 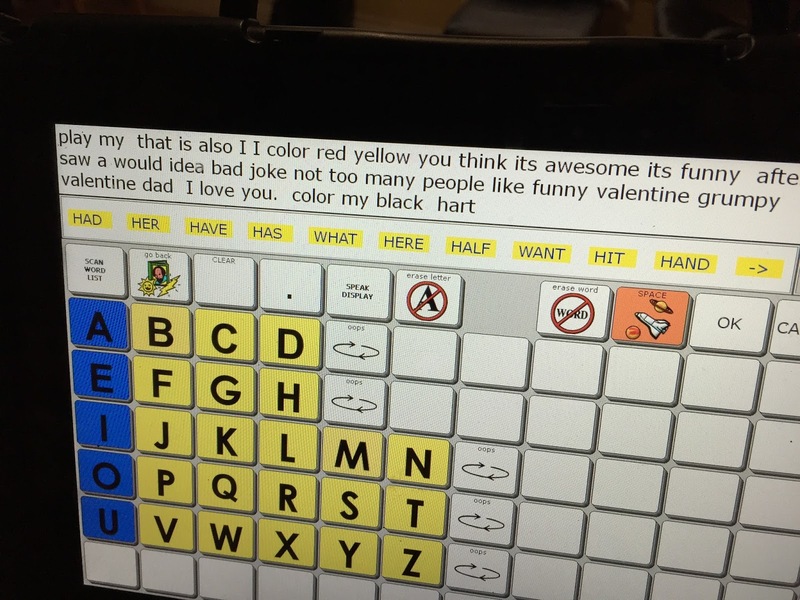 He wanted it to be a red heart on yellow paper. He drew the first eye, them the second. A little nose and then a frown. 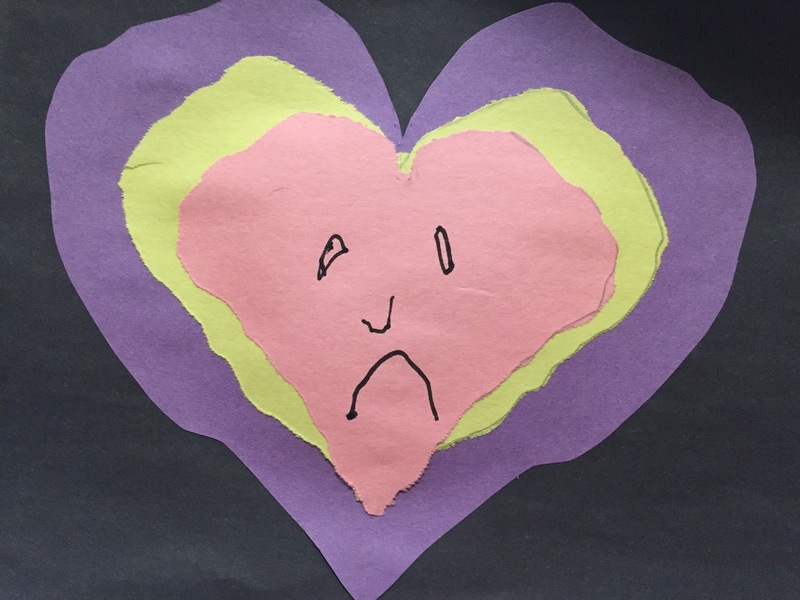 I asked him why his heart was sad. He said it was funny. But he seemed a little unsure of how his joke was going to play. He asked "you think it's awesome it's funny" "after he saw a would idea bad joke" He was afraid Daddy wouldn't think it was a funny joke to have a frowning heart. Mary and I made sure he knew it was HILARIOUS! He said, " Not too many people like funny valentine." 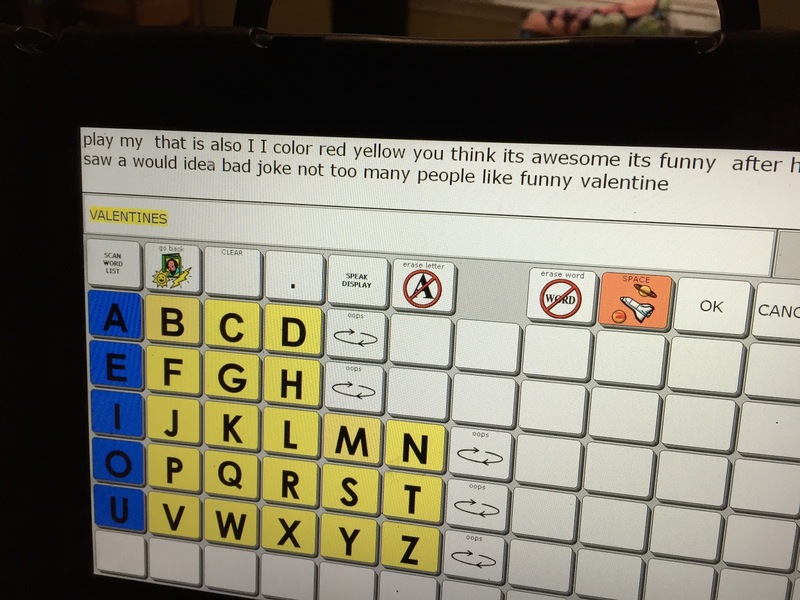 He wanted to sign his Valentine, and let us in on the joke he was making up. 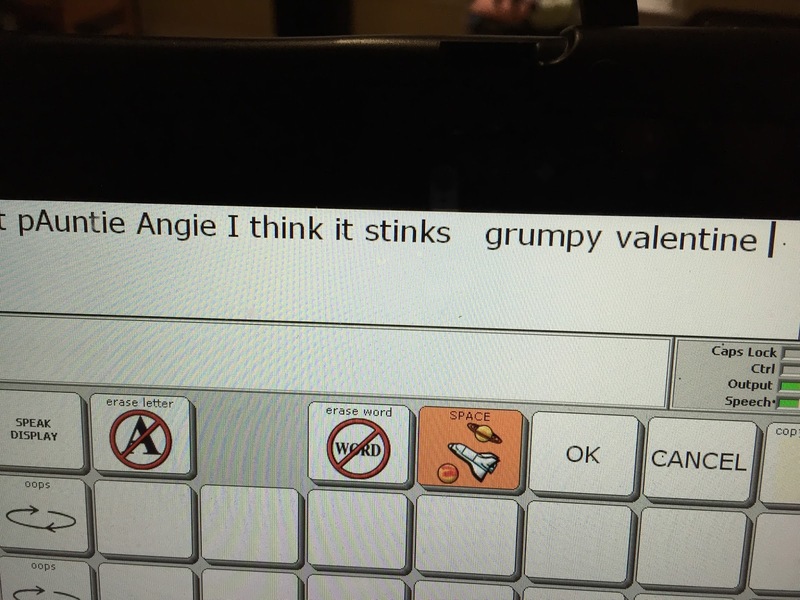 This was a Grumpy Valentine. 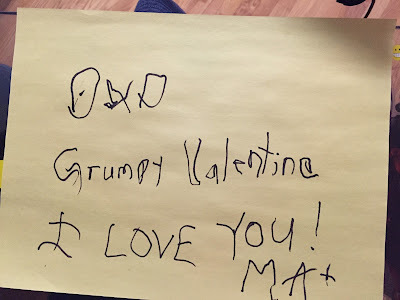 He said he wanted, "Grumpy Valentine Dad I love you." 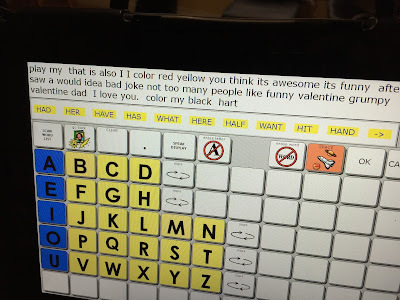 After he wrote his card out to his dad, he said "color my black h-a-r-t." He was on a roll with the jokes...saying Daddy had a black heart, something Steve likes to joke about...he likes his coffee like his soul/heart. 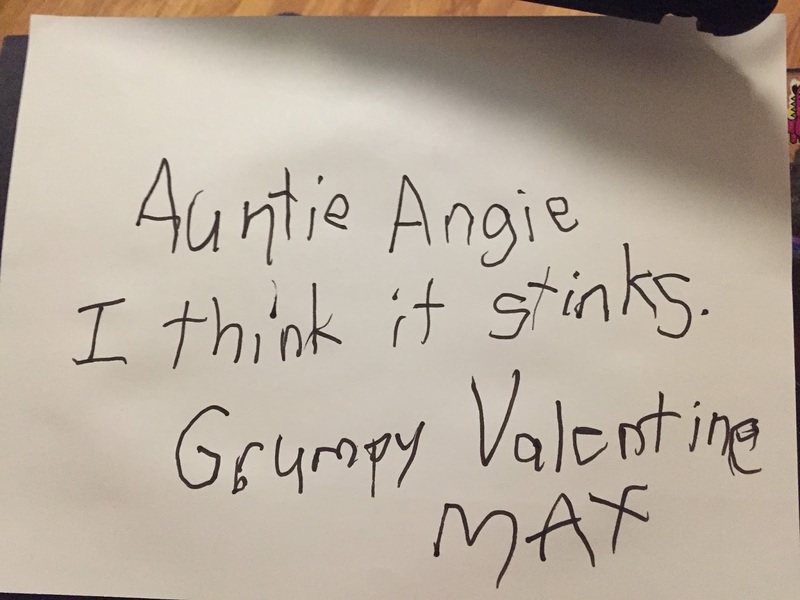 Next, Max wanted to make a Grumpy Valentine for his aunt. He chose a black background and wanted three hearts for hers. 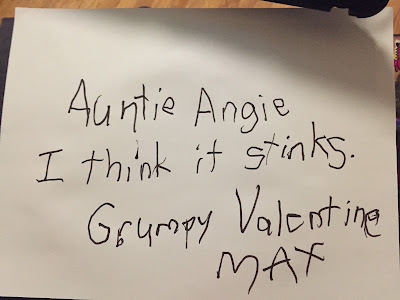 Who knows at what point he started thinking it was funny to say Auntie Angie stinks, but this is how he came up with telling her she stinks. Now he was on a roll with the jokes and was cracking himself up!! 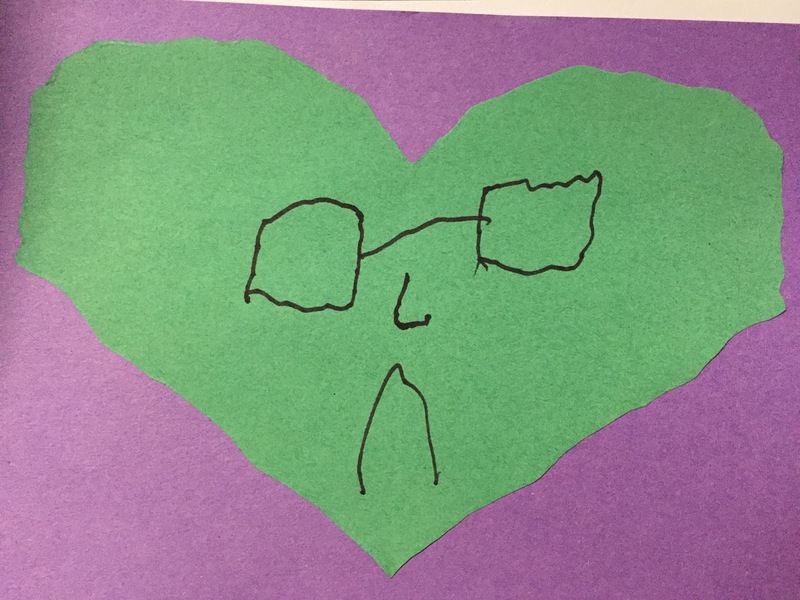 This is an example of how he made all his hearts. 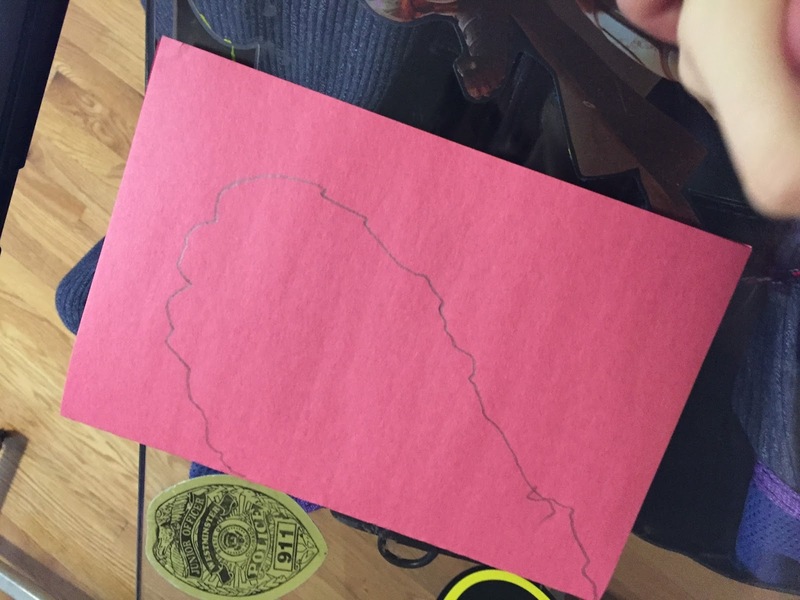 He wanted them to be "curly" and cut them out curly too. 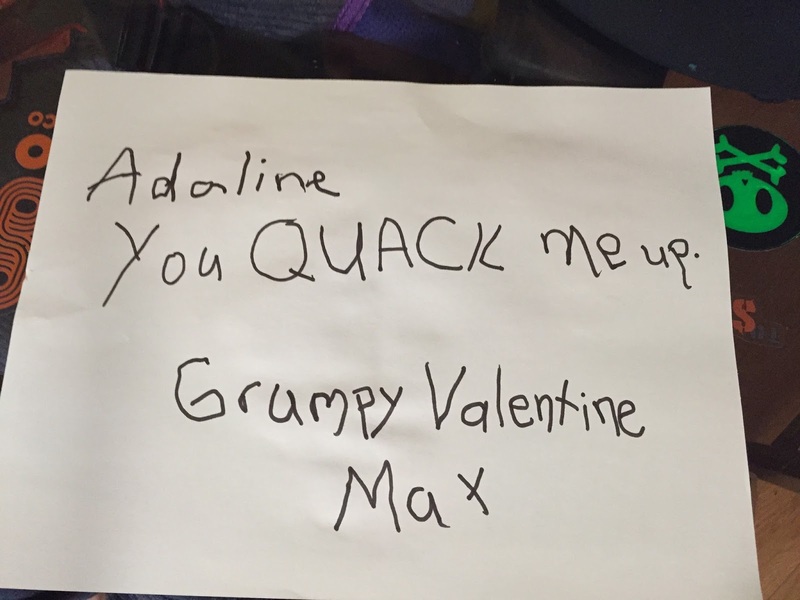 This is Adeline's Valentine. He came up with a great pun for her Valentine. 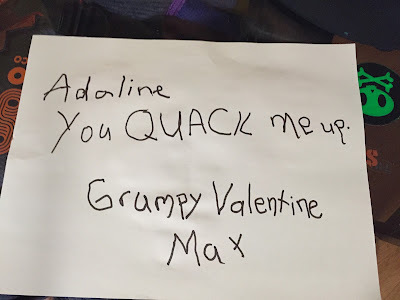 He said "Quack Duck", then said "Adeline, you crack me up." I asked him was he being silly and said "you quack me up?" and he said Yes! These were all he could finish in school. When it was time for Speech Therapy, he told Robby he would watch a video with him, but "first Grumpy Valentine Uncle Dan." He had one more to crank out before he watched a video with Robby. Uncle Dan's has glasses, like he and Uncle Dan wear. He said this one needed to be purple and green and it was "most awful grumpy valentine". 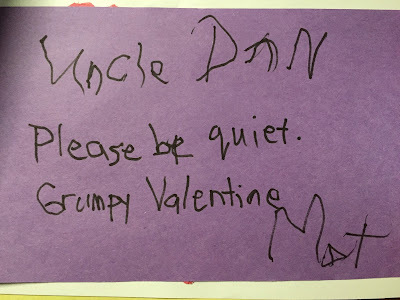 His special message for Uncle Dan was to tell him to be quiet. We've always had a suspicion he was being a bit cheeky when he would tell us to be quiet. Today, he was pretty low energy. 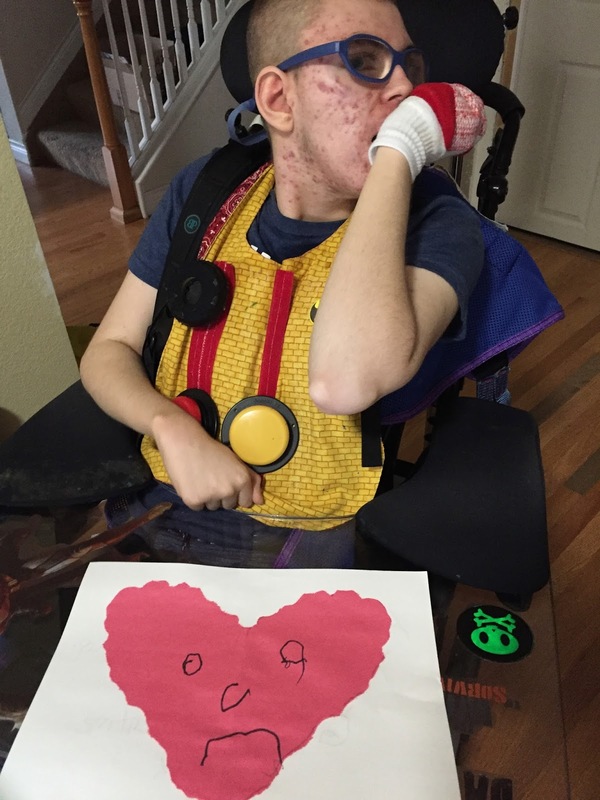 He was awake all night, but was determined to go to Denver to take his Valentine's to them. He even came up with the sweet treat he wanted to get Addie - Booger Jelly Beans! The picture is blurry and not the best, but we were doing our meet up in the van before they had to run and we had to hurry home for Max's nurse. He got a couple of special Valentines from them, and he got to give his Valentines to both of them too. It was so interesting watching him be able to get this idea out. It was also interesting to watch him be unsure of how it was going to come across. We've never seen him reach this way in trying to see if what he was saying was appropriate, or if it was coming across as funny like he meant it to be. It was so cool to see him considering it all, and work so hard at getting his thoughts out. He has had a really good week...just a little tired as he continues to come down from the steroid. 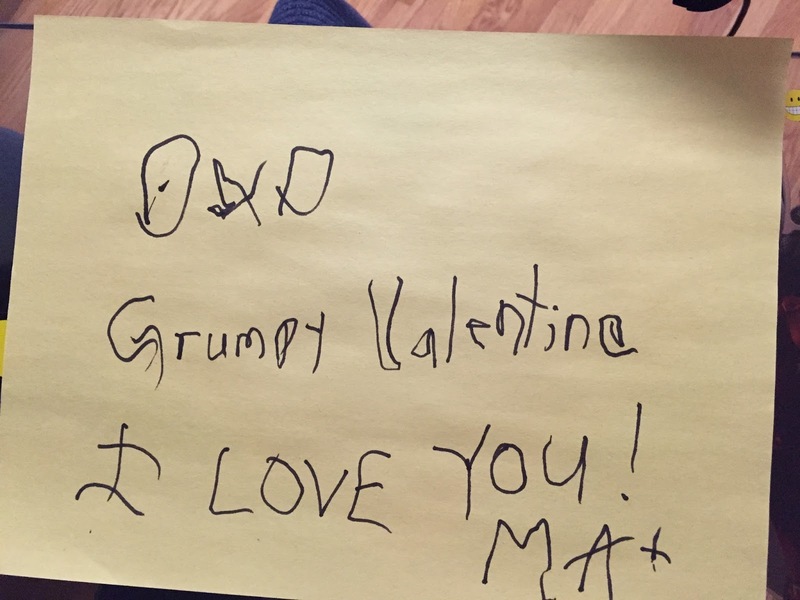 He really liked being the "Grumpy Valentine" this year. It was a title he let us call him all week. 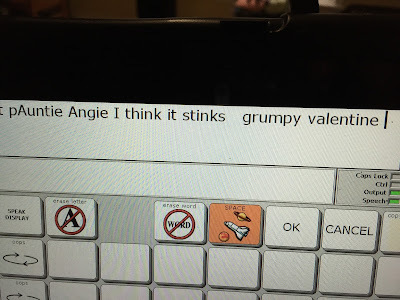 He's still my sweet, thoughtful boy...even if he's grumpy.